The state of California offers endless opportunities for thrilling adventures! Yosemite National Park is an incredible place to visit for those who love spending time in the great outdoors. Whether you want to hike to the peak of a towering mountain, gaze at a magnificent waterfall, or explore a grove of giant sequoias, you’ll never run out of amazing things to do here. If you’re looking for an exhilarating activity filled with adrenaline, you need to try embarking on one of the many Sierra Mac River Trips! You’ve never experienced rafting quite like this before, so take a look at what they have to offer and start planning the trip of a lifetime today. Sierra Mac has been in operation for over 50 years, providing visitors and locals with some of the best rafting trips in the area. The owner of this company, Marty McDonnell, has a love of rafting that began in his teens when he was building and selling kayaks out of his parents’ basement. This passion transformed into starting his own business in the 1960s. To this day, Marty makes sure to hire the most hard-working, experienced staff members to ensure that all their guests have the most enjoyable rafting trips possible. Whether you’re a thrill-seeker or just looking for a relaxing ride down a river, Sierra Mac River Trips has the ideal option suited just for you. Take on the challenge of Class V rapids on the Cherry Creek/Tuolumne trip or simply float along the river that runs through the Yosemite Valley. You can do half-day trips, one-day trips, or even combination trips that can last up to two days. See all their different trips on their website to find out which one works best for your taste. Another excellent reason why you need to book with Sierra Mac River Trips is their prime location. They are found just 15 miles from the gateway of Yosemite, making them the closest rafting company to this park and easy to find and access. Stop by and begin your adventure! Come Stay With Us at the Hotel Charlotte During Your Next Vacation! 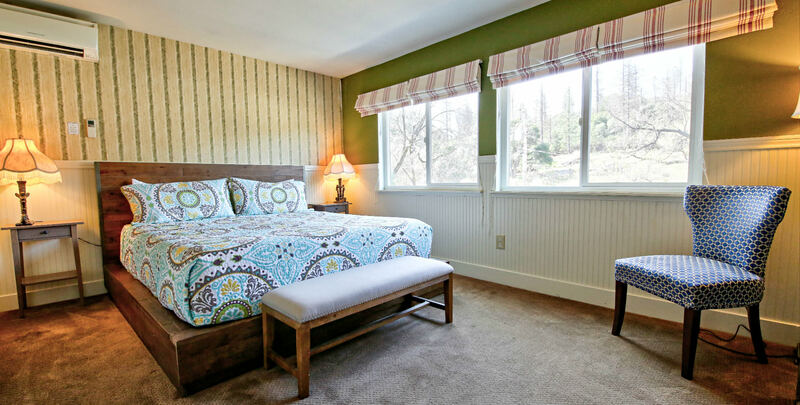 After an exciting day out on the water, come relax in the comforts of Hotel Charlotte, a historic bed and breakfast in Groveland, California, located at the gateway of Yosemite National Park. We offer luxurious lodging and outstanding amenities; we can even book you a Yosemite private tour, as we are partners with the wonderful tour company, Yosemite Family Adventures. Here at our bed and breakfast, you can choose from staying in one of our twelve lovely rooms or renting one of our cozy apartment rentals, which have the perfect amount of space for families or groups. We also have a beautiful living room, friendly and helpful staff, and even our very own Fork and Love Restaurant, so everything you need is right here! Don’t wait another minute to start planning your dream vacation; check our availability and book your stay today! While you’re planning your trip, be sure to download our free Vacation Guide! This is your ultimate resource for finding the best things to do in Yosemite National Park!